About Leylands Park Leylands Park is a very pleasant little ground. Unfortunately it seems like the clock is ticking on the club’s tenure here as it is council-owned and they are keep on developing the site and moving the football club to the Sports Centre on the edge of town. 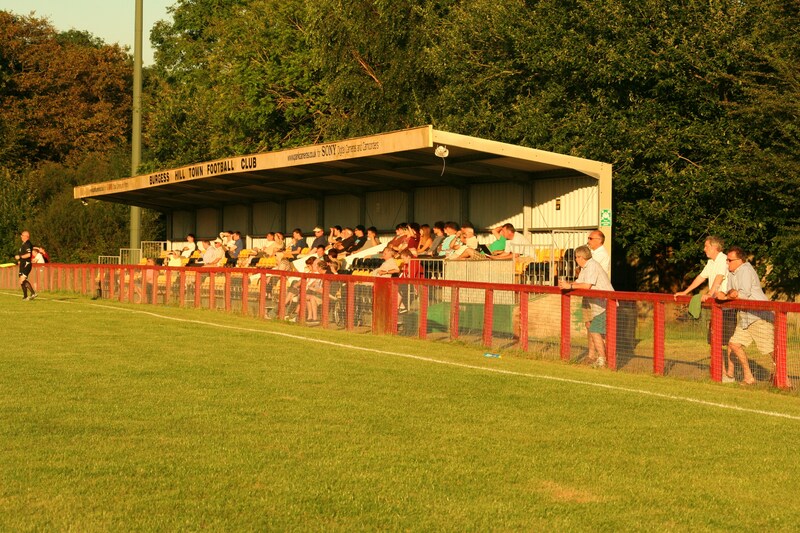 It has one main stand, running half the length of one touchline, straddling the half way line and this is the only “stand”. The rest of the ground is surrounded by tall trees and a fence. The club house, behind the end you enter the ground by is impressive. How to get to Leylands Park The ground is quite difficult to find, hidden behind trees and houses in a residential area. From most directions you will come via the A23. Exit at the junction with the A2300 and follow this towards Burgess Hill. At the St Paul’s college roundabout turn left and then straight over at the next one. At the third roundabout take the third exit into London Road (s/p town centre). At the next roundabout, turn left into Leylands Road. After 3/4 of a mile and after you have gone over a roundabout take a left at next one into Leylands Park. The ground is hidden behind the houses straight ahead. There is a small car park inbetween the houses. If you are coming by train then the nearest station is Wivelsfield which is a 5-10 minute walk away. Come out of the station and walk down Gordon Road. Turn left into Junction Road, and then left at roundabout into Leylands Park. Then right into Maple Road after a few hundred metres. Admission to Leylands Park Admission this season is £8 for Adults, £4 for Concessions and Under 16’s enter free. Our last visit – July 2012 “I have a Slimline brief-case and I use the firm’s Cortina. In every roadside hostelry from here to Burgess Hill” So what did you do last night? It was the hottest day of the year so far and I found myself outside having a refreshing pint of Magners (hint, hint for sponsorship opportunity? ), surrounded by trees and watching a bit of footie. No real surprise there then. In fact it summed up my location quite well. Burgess Hill. 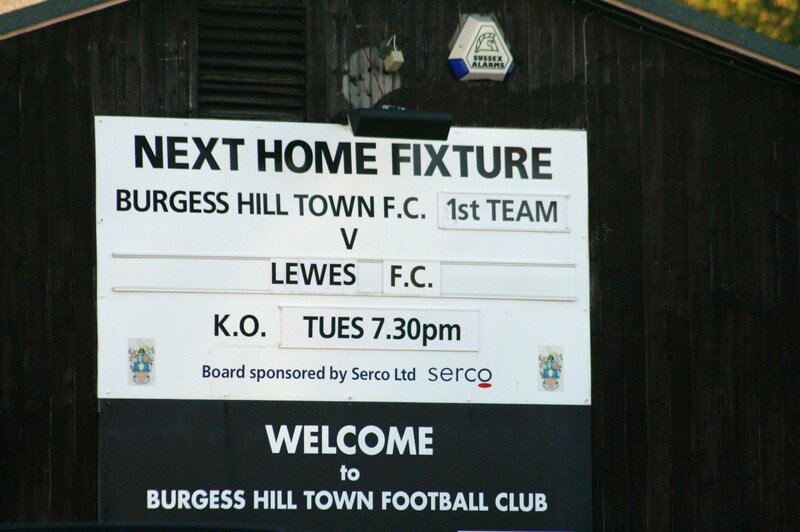 A town that doesn’t quite know where it is, laying almost on the border between East and West Sussex (calling itself politically correct Mid-Sussex) and home to Ryman League South’s Burgess Hill Town, or the Hillians. Whilst researching what to write, I struggled to find much to get the pulse racing about the town, although the fact that Holly Willoughby was schooled here, and Simon Nye came up with the idea for Men Behaving Badly (the two aren’t related alas) whilst living here does suggest there is the potential for life amongst the neat front gardens. I did find the words written at the top of the page, from Poet Laureate John Betjeman who of course also immortalised Slough by requesting it be bombed. I cannot see any evidence that John popped into the town, although perhaps if he knew Holly was wandering around Checkers Nightclub in her school uniform he may have paid a visit. Enough about a certain TV presenter. I was a Burgess Hill virgin and was only in town to search out Leylands Park for the visit of Lewes to play the Hillians. This proved harder than anticipated as the whole town was completely devoid of any signage. Thank God for Google maps, although once I had located the ground, finding the entrance was just as much a problem. The ground is nestled in the middle of a 1970’s housing estate, and only accessible on a road which appears to take you to some garages. A sign or two wouldn’t go a-miss. Preparation is the key in pre-season and you certainly can’t fault Simon Wormull for trying to maximise the game time. This was to be the fourth game for the team in just seven days after the exploits against Brighton & Hove Albion, Crystal Palace and Dover Athletic. The team that was to start the game was almost all pulled from the Under18’s with a couple of wise heads thrown in for good measure. Up front a new chap was starting. The board outside the club house which showed the line-ups listed him as A.Trialist. But Terry Parris, a Lewes legend and a fellow director knew better. “That’s Saha’s brother” he told me with a sly finger tapped to the side of his nose. “Saha? Really?” I was careful to avoid a George Weah’s cousin situation here, but he confirmed the fact. Imagine that – Louis Saha’s brother playing for little old Lewes. I would imagine it would only be a matter of weeks before Louis would be down at the Pan supping a Harvey’s and enjoying a delicious Rooks Pie (gratuitous plug there). I, of course, Tweeted the fantastic news only to be brought shuddering down to earth by Club Sec Kev who I bumped into on my walk around the ground. “Not Saha, but Zahar’s brother”…apparantley he was at the Crystal Palace game on Friday night, had a word with one of the coaches and Winfred’s your brother, he was in the starting line up. Burgess Hill Town 2 Lewes 1 – Leylands Park – Tuesday 24th July 2012 We all know it is all about the performance and not the result, right? This was a game of two halves, with neither going Lewes’s way in the first half but scooping both honours in the second. Burgess Hill fielded a strong starting XI, with only Thorp, Howell and Breach potentially first teamers in the line up and soon found themselves two goals to the good. Both goals were down to pressure from Burgess Hill on the young Lewes defence, forcing them into mistakes on a fantastic playing surface. Still, the whole purpose of the game was to give some match experience to the young Lewes players (although had we been 2-0 at half time I would have suggested it was for local pride) and so it was no surprise when at half time Simon Wormull made some changes, bolstering up the side with Steve Robinson, Steve Brinkhurst, Lewis Hamilton and himself. In fact it was Worms who pulled the deficit back on the hour mark with a perfectly flighted free kick from twenty-five yards that had the Burgess Hill defence and keeper looking at each other as it sailed into the net. 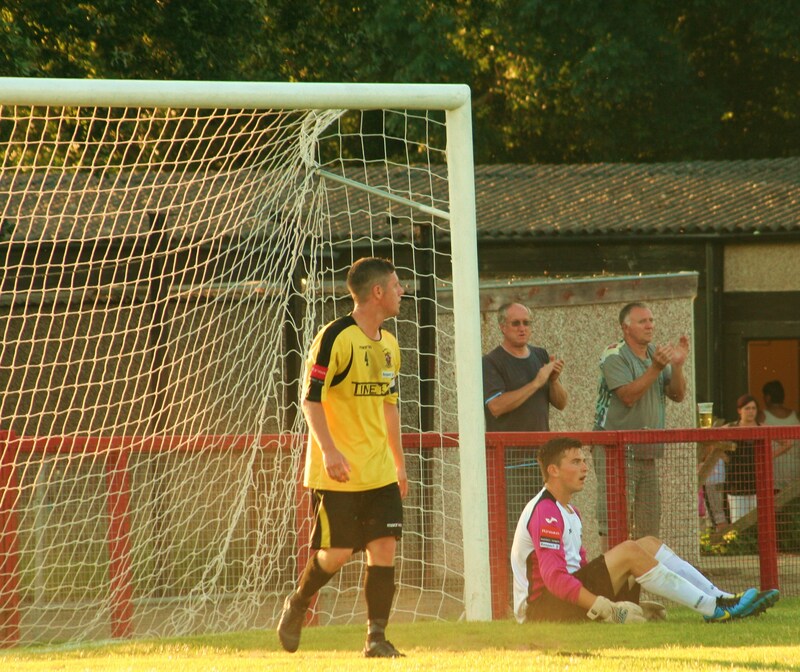 Despite some heavy pressure on the home goal, Burgess Hill held on for the win. They could have had a couple more themselves if it wasn’t for the safe hands of Thorp in the Lewes goal. One man who could breathe a sigh of relief was Pav the kit man. His washing machine had taken the brunt of the hectic last week and he was “fed up of ironing jock straps and socks”. The glamorous life of working at a football club. So half-way through pre-season and the scorecard read P 6 W 2 D 1 L 3 GF 4 GA 11. Take away the two defeats to full strength Championship sides (only 6 levels above) and you can have some real heart from the progress of the club. Next up? 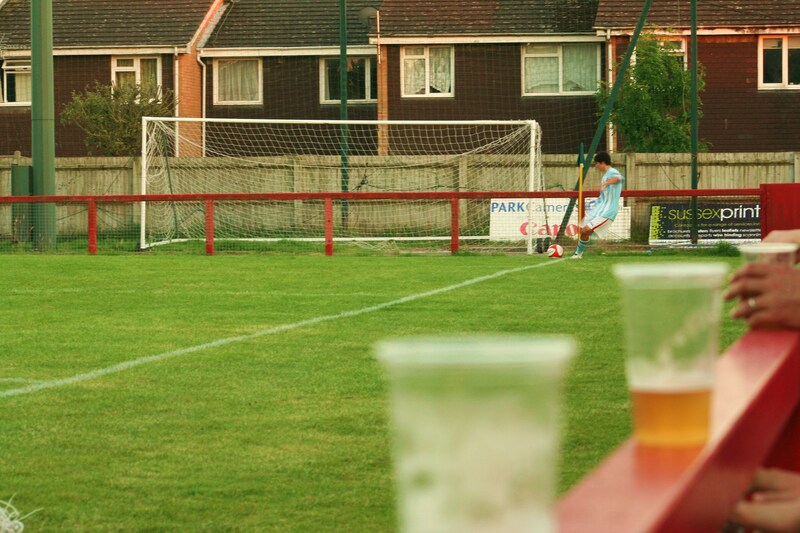 Another Sussex derby on Saturday away to Ryman League South new boys Three Bridges. Alas I would have to give that a miss as Cowdenbeath’s Central Park beckoned.